My Experience Pursuing OT as a 2nd Career! If you’ve been considering pursuing OT as a second career, you may have many of the same questions that I also had just a few years ago. Will it be worth it financially? Will I feel more fulfilled in this profession than I have been with prior work? What are the physical and emotional demands of higher education after having been out of school for years… or decades? 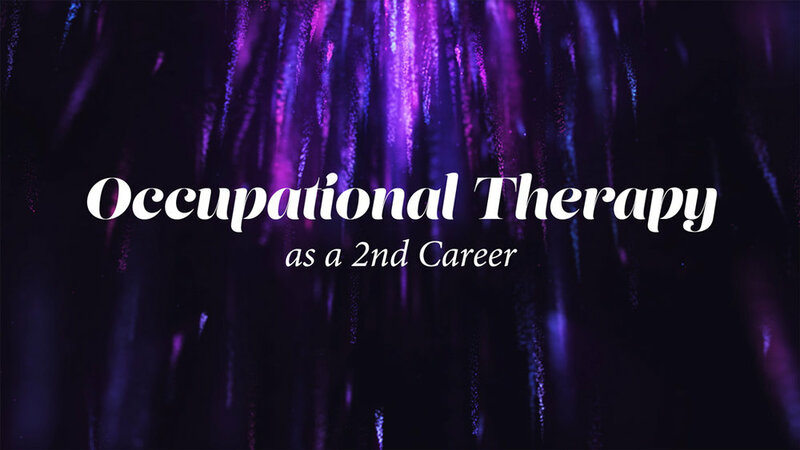 Kate Washa Boyd shares her experience pursuing OT as a 2nd career. Of course everyone has their own unique circumstances so I can only speak for myself. At the time I learned about OT I was 10 years into a job that I enjoyed, but was grossly underpaid for, and the job was both physically and emotionally taxing. I had been looking for another line of work for years, but living in a declining rural town with no local opportunities I knew I’d have to pursue further education in order to find a career with good prospects. My husband and I had some savings and no debt other than a reasonable mortgage payment, so when I discovered OT (after minor surgery on my hand) I thought this profession could be a good fit. Prerequisites: My bachelor’s degree from decades ago was in an unrelated field, so I had to take every single prerequisite class required for all the MOT and MSOT programs I was looking into (and in some cases, prerequisites to the prerequisites!). Completing all these classes as a full time student took 2 years at my local community college (CC), but was well worth it. I used this time as an opportunity to explore whether I enjoyed being a student again after almost 20 years in the workforce. This was a very affordable way to dip my toe into academia again, and I met many new friends in the process. I wouldn’t trade my time there for anything! Due to the cost of post-graduate work I only seriously considered schools in my state (NC). Through my local CC I found some excellent leads on funding, the most promising of which was a Forgivable Education Loan for Service (FELS) that’s available in NC: https://www.cfnc.org/fels. I applied for FELS before even applying to grad schools, and consequently the funds kicked in starting my first OT semester and covered both academic years: $20,000. This funding didn’t cover all tuition, books and fees, but it did prevent us from having to take out any loans or tap our modest 401K funds. I chose to quit my job to focus on prerequisites (and later OT school) to fast track the process, and we hemorrhaged money for my health insurance and all the school expenses beyond the $$ from FELS. Once you’re in your OT program, I recommend that you apply to any scholarships offered by your program, Allied Health, or anything else you can find. I applied for a $1,000 OT scholarship in my last semester of grad school and was given that one, plus another Allied Health scholarship for $2,000, which I believe may have been in large part because not many people applied for them. That was well worth the time it took to write a 1-page essay, and in retrospect I wish I’d taken the time to apply for other scholarships along the way. In discussing pros/cons of OT as a 2nd career with a couple former classmates, it’s the general consensus that the time and expense was worth it. Primarily if taking a job that pays well, such as in a skilled nursing facility (SNF) or Home Health (at least temporarily) in order to more quickly pay down any student loans. I took the summer off between prerequisites and beginning grad school to work on the house, improve my diet, and get fit. This time to myself was beneficial in that I was able to start OT school with a sound mind and body, and was able to carry these good habits over through at least my first year. One unique thing about my own experience is that the school I attended was 300 miles away from my home and husband (and his good job), so I moved away for 2.5 years, which was more emotionally taxing than others may experience. I missed my husband, who is my rock, and was extremely lonely when my part-time roommate went home to her own family on the weekends. Additionally, I started grad school at the ripe old age of 44, most of my classmates were about half my age, and even a couple professors were younger than me. But many of my cohorts were wonderful, lived in my apartment complex, and taught me about popular culture, haha. After the first semester of being quite lonely, despite several friendships, I brought one of our cats from home to the apartment, and she was very good company for the remainder of my time there. Switching from CC level demands to grad school level demands was often difficult for me. In my two years of prerequisites I routinely made the highest grades in my classes and garnered praise and admiration from professors, but this abruptly changed with my first semester of OT school. My younger classmates seemed to struggle less than I did to understand challenging concepts (neurology, yikes!) and it occurred to me that many had come straight from a bachelor’s program and had finely honed study skills that I didn’t possess. It got easier after that first semester, particularly after I developed methods to organize the immense amount of work that had to be done. To be clear, not all of the classes were tough… some were a breeze, and it really depended on both the subject and the professor. Out of the entire program I made two B’s and the rest A’s, which isn't too bad for an old fart in a sea of wonderfully sharp young people. I wouldn’t say that the program was physically exhausting other than a lack of sleep on occasion when studying for a challenging midterm or final. In retrospect I performed much better and was most healthy physically and mentally when I took time for healthy meals, exercise, and rest. This is also true now that I’m a year into my first OT job. I happen to be working as the only OT here and am relying on FB groups for mentoring, as well as very intimidating professional resource books. I’ve been a little stressed with these circumstances and have really let my health go, which is a drain on my energy. I wouldn’t say the job itself is physically taxing at all, though that may be different for OTs who choose to work in pediatrics and are crawling around on the floor all day. Looking Back Now, Has the Change Been Fulfilling? I think fulfillment has a lot to do with making sure you find the right fit with your job. There are many days when I feel like dancing because I’m having such a good time at work, learning, honing my skills, enjoying my coworkers, seeing positive results with my clients, and finding many opportunities to laugh. There are other days that remind me of my old job, in that the tasks ahead of me are tedious or not interesting and I don’t particularly want to get out of bed. Is it better than the job I had before becoming an OTR? Yes and no. The focus on productivity and documentation can be stressful, but I happen to have a job where there isn’t a lot of pressure to hit productivity daily, and I often don’t even think of it let alone stress over it. For me a lot of productivity success has to do with the census being high vs low, whether the clients are motivated, if outpatients keep their appointments, and navigating my job as the only OT with essentially no mentoring. I spend a lot of my own time looking up research, and in FB groups asking experienced OTs for advice. I’m earning roughly $10/hr more as an entry level OTR than I was working in an office pre-OT, and am hopeful that I’ll get a decent raise at my 1-year review as I’m frequently told that I’m exceeding expectations, even as a recent grad. This may simply be due to life experience that younger new grads lack, through no fault of their own. This is a better environment, I feel appreciated by my supervisors, and I usually feel confident that I’m helping my clients. I’m mainly only frustrated when having to constantly define what OT is to people who should know… but that’s a whole other story. My nearly daily regret is only that I didn’t know about OT decades earlier. I think of what I’d like to accomplish in the field, including research and various specialties, and 20-ish years before retirement just doesn’t seem like enough time. But I don’t let that hold me back, and most days I choose to view it as a challenge to squeeze as much fulfillment out of my new role as I can. I don’t believe that we should ever let age dictate our dreams. I quit my job to focus on prerequisites with the goal of making an A in every class (which I did!) so I could demonstrate to the application committee that I would be a safe bet. I took a pre-OT class that one of the NC schools offered in order to have some working knowledge of OT to inform my application essays. I also had a friend with grant writing experience go through my application essay and help me with concepts and wording. I did all of these things to make my application as competitive as possible, especially given that I was pretty sure my GRE math score would lower my overall GRE score. In retrospect: I wish I’d done more shadowing in different settings during those non-stressful CC days to give me a better idea of the vast range of OT, and to better inform my interest areas for selection of fieldwork sites. There’s no way to predict the future, but I wish I’d done a 3-month fieldwork in a setting that had at least some resemblance to the area I wound up working in. If you have any questions or thoughts about this transition, please leave them in the comments! Kate W. Boyd, MS, OTR/L, is an Occupational Therapist at Blue Ridge Regional Hospital and Rehabilitation Services in Spruce Pine NC.